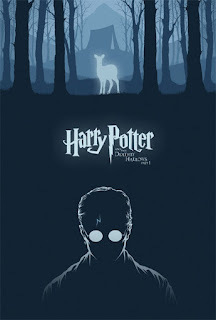 Here's my poster for Harry Potter and the Deathly Hallows Part 1. 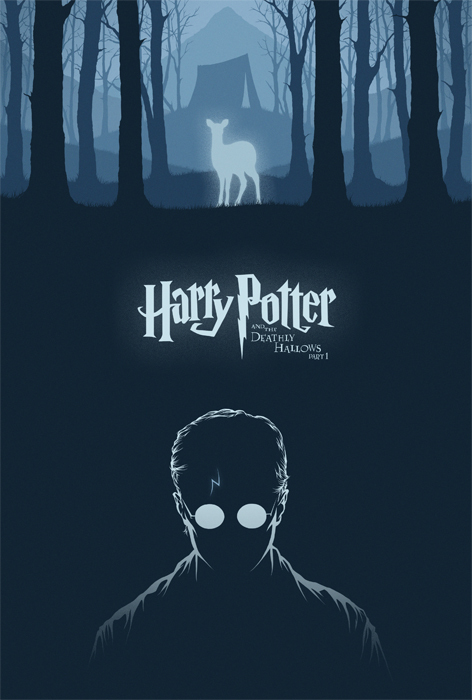 Other than Prisoner of Azkaban, this is probably my favorite of the HP films. Directed by David Yates, the film is essentially the calm before the storm, before the final showdowns at the Battle of Hogwarts. It's surprisingly mature and emotionally rich, while still providing impressive action beats. Harry, Ron, and Hermione go on the run and try to finish Dumbledore's work in destroying the Horcruxes. Meanwhile, Voldemort grows stronger and gains power and influence across the wizarding world. Front and center is the silver doe patronus that leads Harry to the sword of Gryffindor underneath the ice. The patronus makes for a great image and is pretty beautiful considering who sent the doe to help Harry. With this poster, I'm 3/4 of the way done with six out of the eight films. Next up is the Deathly Hallows Part 2, which I'm tremendously excited about, before I go back and knock out Sorcerer's Stone. Love it! Can't wait to see what you'll do for DH2! Just out of curiosity, how do you choose which color to use to represent each film? I'm always curious what colors people most associate with each book/film. I tend to go off the books, especially the later ones that are all monochromatic (5 is ALL BLUE, 6 being all green). Just wondering. Like I said, can't wait to see the final 2 and hopefully pick up the entire set! Hello again! 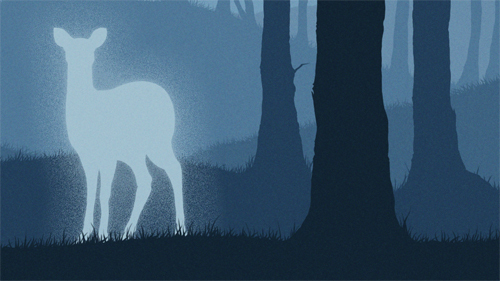 I generally try to pick the colors that I think represent the tone and mood of the particular film while still considering how the whole series of posters look together. so for DH1, I thought a cold blue would match the isolation the trio feels while they're on the run. I'm also trying to avoid the colors from the books, although I completely adore them. Gotcha. Thanks for answering. Keep up the amazing work!